So, I've been in a really good college choir this year, and it's given me even more of a taste for choral music than I already had. Basically, I start with what my choir sings and branch out from there- my director picks quite diverse programs, so this actually covers a lot of ground. Here's my favorite piece from this year's seasons- one of Morton Lauridsen's faux-madrigals (20th century) as sung by a select group from my choir. It's an m4a, my apologies. Anyway, anyone else have some favorite choral music to share? I am also going to put this in the sendspace thread because it is some of the best music I have ever heard, but this is Polyphony doing some (a lot) of Eric Whitacre's choral pieces. Whitacre is a genius and his choral work is some of the most beautiful stuff I have ever heard, and it is only made better by the great sound and recording of the choir. I recommend the entire album, but if you really have to pick and choose, my favorites are "A Boy and A Girl", "Cloudburst", and "Lux Arumque". I know the capitalization seems weird, some of it is from the source text that Whitacre uses for his pieces, some of it is because I am still seeding the torrent I got it off of and can't change it. Whitacre is amazing, I've sung A Boy and A Girl and Sleep this year. I highly recommend that everyone passing through download that package. I realise it's not strictly speaking choral work, but as far as vocal harmonies and parts and countermelodies, you can't go wrong with the Beach Boys. One of my life ambitions is to find a vocal group good enough to perform 'Good Vibrations' live, competently. This is more a choral setting with background orchestra, so less of a "choir" feel, and more of an orchestral one, but I love Williams' work, "Serenade to Music," which basically a dreamy melange of Shakespeare's works set to great, ethereal melodies. It's a trip. Most of the choral music I have is from my high school choir, so I'll share a couple of those first. We were not that great. Good for a high school of our size, but whatever. Otherwise, here is a song by a men's choir from my college. They are good. Oh, man, IO...Cloudburst is SUCH a fun piece to perform! I did it once in high school and then again in college. It's an incredibly powerful piece. I was always a big fan of the gospel pieces that Moses Hogan arranged. This thread has now made me all nostalgiac for the days when I was in chorus, and I will go remember fondly. Back later, guys! I've been doing choral music for several years now. Last year I did the Messiah, but I'm not so into Handel or baroque because it has the sickening tendency to all sound the same. I also sang the Durufle and Faure requiems, but my favourite big classical work to sing was one of Mozart's missa brevises (don't remember which). My school choir has a more modern tint to it. Barmymoo had just made a point in another thread, about performing the Faure Requiem as part of a Sunday evening service. I wanted to know more. In the process of PM-ing, it occurred to us that a choral music thread might be of interest. I found this one, last used in 2007. Choral thread! I suspect it might just be the two of us in here, but never mind. Tonight is the first rehearsal for our Beethoven's Missa Solemnis concert next term. 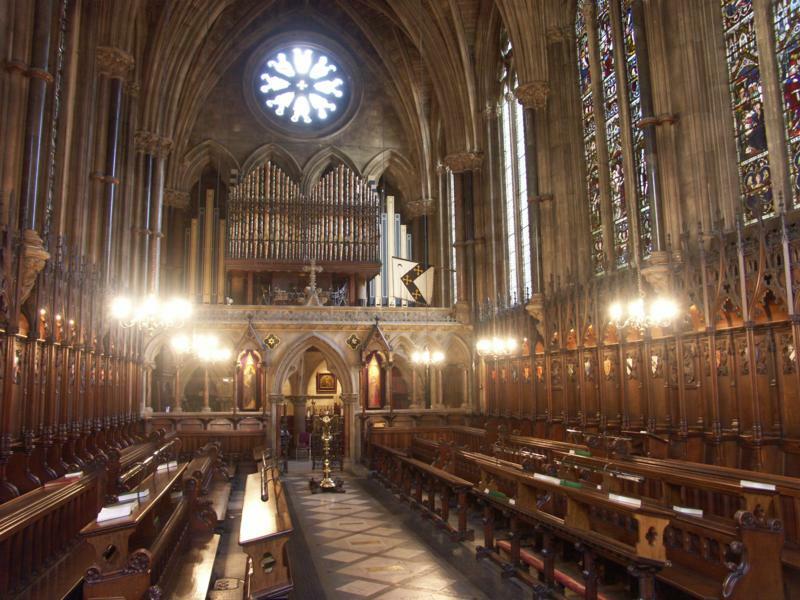 Apparently the chorus will be made up of our choir, Jesus College Choir, the university Chamber Choir and a few hand-picked members of the chapel choir a tier below ours. And then some professional soloists. I'm reserving judgment so far, but last year's equivalent concert was a nightmare. Considering the number of recordings of my choral concerts and other things that I've posted in this forum in the past, that's not quite fair! OK, the three of us. Plus Carl. I wish we could change the name of the thread though. It sounds like the name of an ancient educational radio programme, either CBC or BBC, and the name followed by a bang! What was last year's concert, and why was it a nightmare? Were there train wrecks in performance? I can't recall more than two or three bad performances. Mediocre, probably, but not bad. I think we did a train wreck in a Messiah performance, although we'd done it annually for years. And a director who was perfectly at home with most 18th and 19th century music and could do Rutter quite well (Magnificat, Gloria, Requiem), led us in an abysmal Carmina Burana. Sorry Paul! Temporary brain fart. I thought of you when we first discussed the need for this thread. Last year's concert we did Debussy's La Damoiselle élue with just the girls, and then the final movement of some Wagner thing that lasted for about an hour and only included two minutes of alto and sopranos right at the end. We didn't even get to go out on stage to sing it - just stood backstage, and the top sops had to face away from the audience end so that they sounded further away. We sat for hours and hours listening to the men rehearse and on one notable evening were kept for an extra 45 minutes after a rehearsal meant to finish at 10.30pm and were not actually used at all. The conductor was just appallingly thoughtless. I'm sure he's a musical genius but it was a nightmare to be part of. This year's one is much better - it's predominantly choral with solos over the top, not long stretches of just soloists. It was fun romping through the whole Mass in three hours, although I anticipate having to do a lot of individual work on it to get the notes right. Which is nice, it's good to actually be challenged by the music. Carmina Burana is easy to get horribly wrong. I don't know much about Debussy and choral music -- Nuages? Is there women's chorus there? But I downloaded the La Damoiselle élue with Dessay in the starring role. I've seen her in a couple of Met Live in HD productions; she's also a good actress. It does sound like the women were abused in that rehearsal schedule. The Wagner sounds like the Schoenberg Gurre Lieder I mentioned: The music, written in the 19-oughts, was very Wagner-like. There were five or six soloists including a "Sprecher", and the men were divided into three four-part choruses. The women sang only in the last SSAATTBB section, for just a few minutes. I can see how Carmina Burana would be easy to get wrong, but my experience with was a happy one, from 1971 when I first heard/rehearsed it to 2007 when I did it as a baritone. Only the one bad performance. Did you sing the entire Carmina Burana cantata (I think that is the correct term? ), or just "O Fortuna"? Oh, the whole thing. I don't think I ever sang O Fortuna by itself, and I don't much care for it. I've considered myself a kind of marginal tenor, now a marginal baritone, though I've been on a stage with the Phila Symphony, Antal Dorati, Neeme Järvi and Luciano Pavarotti. But I felt like a Carmina specialist, even to nailing the strange accents in the guy's drinking song, In Taberna. 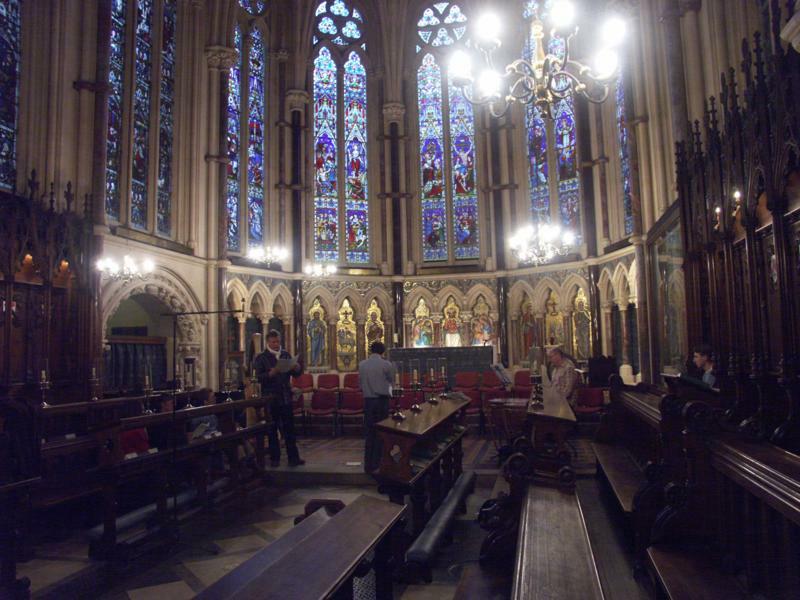 I'm singing in a small informal chorus for the choir college's Christmas concert, and we had a rehearsal the other day. My throat was so sore that I discovered I had bottom Cs (as in two octaves below middle C - I was singing the bass part sometimes). I normally only just have bottom Fs, so that was quite amusing. I wonder if i can hit that note. I'll try at rehearsal tonight. I don't think I can. I suspect you can - since I confused myself and am actually talking about one octave below middle C, not two. I suspected that. I tried just now. I can't do two below middle C.
I can't routinely, but with a bit of training I can get there for a while. And we've done several a cappella pieces recently that required extended singing below the bass clef - I do like it when it works! I sang tenor in the rehearsal last night, so that the tenor who was there could sing bass. We've yet to have everyone turn up to the same rehearsal... I just managed to get the bottom Es this time, because my throat is getting better. Today I suspect a bottom F would be my limit as normal. Twelfth Night's annual public concert is Sunday, and in one of the songs, the basses start from a low F in several ascending lines. We don't have much gravitas. Maybe if we were miked. Low notes are always harder in concert, I find. Today we sang at a wedding, of a former chorister from the college. We sang Parry's I was Glad as the bride entered, Willan's Rise Up My Love before the marriage itself, Howells' Behold, Monteverdi's Cantate Domini, and an arrangement of The Beatles' All You Need is Love (complete with surprise trumpet) during the signing of the register, and the Hallelujah Chorus as they left. The hymns were Love Divine and Jerusalem. If anyone wanted a primer in Anglican choral music, that would be it. I may have to find some of those songs, on iTunes or whatever. I did that with some of Paul's, I think, and listened to some or all of the music he posted, then forgot to say so! Just back from New York tonight, and insufficiently memorized for tomorrow's concert in Detroit. In northern Michigan, a Congregational church was the venue for a performance of Karl Jenkins' "The Armed Man." It was performed with a video of scenes illustrating the work, including battle and reconciliation. It includes a Muslim call to prayer, two minutes out of the 67 or so. The church leaders excised the audio of the call to prayer, though they apparently left in the video. I'd never heard of the work, but I downloaded it. It's dramatic. I've sung the Armed Man, it is incredibly moving. We sang it to the memory of the father of two of the choir, who had died suddenly - the performance was already planned when he died, so we dedicated it to him. I don't remember whether we included the call to prayer; I think we did, but I can't think who would have sung it as I don't remember any Muslim children in the choir. Choir week has now finished; we had a concert in a local town where we sang some nice Christmas music, three carol services with some adventy music thrown in (we missed Advent itself because term ended before Advent Sunday!) and a big NSPCC benefit concert in London. We also started rehearsing the music for the CD we're recording in January, of music by Philip Cooke. He's a modern composer who writes some slightly odd (to my mind) music and, apparently from what we sang through last week, some very lovely music. We were pleasantly surprised by it - we expected it to be far harder to learn. The fact that it's easier than we thought means we'll be able to polish it more and get it really good for the CD. Recording CDs is weird; I did it for the first time last year with music for Alan Bullard. By the end we know the music really, really well and everyone's voice is exhausted. One advantage to this thread is searching out what others are singing. But Cooke seems to have absolutely no discography yet. I see at least one of his pieces published on his site, and I suppose I might hear it by submitting it to my music OCR app. Can't find him on Youtube either. Any of you ever hear the Prayer Cycle? Dramatic music, in part because of its theme and how it was produced. Or the sound track from Le Choriste? No, Cooke wouldn't have a discography yet - we're the first to record his music I think! Let me see if I can find something though, we might have recorded something before? OK, here is a video of him awkwardly talking about a piece we're recording, which is almost audible in the background. Doesn't yet sound promising. My large choir in the 1970s tackled, then thankfully abandoned a piece by Charles Ives. But 20 years later, we groaned as a new director started in on Honegger's King David. It was awful! Then it was grand! My microphone has developed a fault, and is going back to the US for repair. I nearly couldn't record Sunday's concert, and in the end the recording needs a lot of work to make it usable (I spent all yesterday evening getting 8 minutes done - the easiest eight minutes, but I'm also getting faster at what I need to do). A pity, as it was particularly good, and also interesting to record because many of the pieces had a spacial element (choir split between the ends of the chapel, soloist in the organ loft). It was Christmas music, but some little-known settings. Geoffrey Bush's Christmas Cantata was done with piano, oboe and cello accompaniment; it includes a really sweet a capella setting of a poem by Hilaire Belloc. Vaughan Williams's Fantasia on Christmas Carols is well known, but how many know the similar, but less over-blown, work that Holst wrote the year before (called Christmas Day)? Adam lay ybounden has been set as often as any Christmas words - but do you know the setting by John Ireland (or any not by Boris Ord)? Fortunately, the concert was also well attended; publicity is typically the choir's main failing. I will link bits here as I get them listenable. Paul, I haven't heard any of those things but I shall hunt some out, I need some decent Christmas music to listen to. We sang the Fantasia at the college Christmas concert and it was surprisingly good. I was actually in the orchestra in the end, did I tell you about that fiasco? I sang all the parts in the chorus (including bass) at rehearsals and then ended up playing violin instead. There is only one recording of the Bush; it was badly reviewed, and you may prefer mine when it's done in spite of the technical problems - though we also didn't do all the movements (a different selection in our case, sanctioned by the composer). The Ireland is artfully simple - you may note that the harmonies are never actually quite the same twice. The Bush comes over well, I think. There's an unfortunate mistake near the end of the Holst, but it passes quickly with no lasting impact; the sound is cut off very quickly at the end, because that was the only way I could save the track - of these it had the worst problems, but they are mostly sufficiently covered by the singing. The baritone soloist is in the organ loft at the other end of the chapel. May, if I put Twelfth Night's two Christmas recordings as .mp3 on Dropbox, would you want to download what sounds new to you? I'd add a couple of favorites perhaps, including the Pinkham Christmas Cantata and the Gardner "Tomorrow Shall Be My Dancing Day." I think we acknowledged that you and Paul are familiar with the Holst "This Have I Done...."
Paul, how large is the chapel? When I think of separating a choir, it begins to seem difficult. In a large reverberant chamber, even more so. My large choir's last subscription performance with the Detroit Symphony was about 1978 in a Thanksgiving weekend performance of Ives' Holiday Symphony. Antal Dorati didn't divide us, he strung us out, 4-5 feet apart in the aisles -- a not very accomplished group of singers in a not very acoustic hall singing some not very tuneful music which lasted about a minute. Almost as disastrous as the guys in the second movement (Lamah rag'shu goyim) of Chichester Psalms a year or so earlier. We did the first movement of the Pinkham a couple of years ago, in our American Christmas concert. 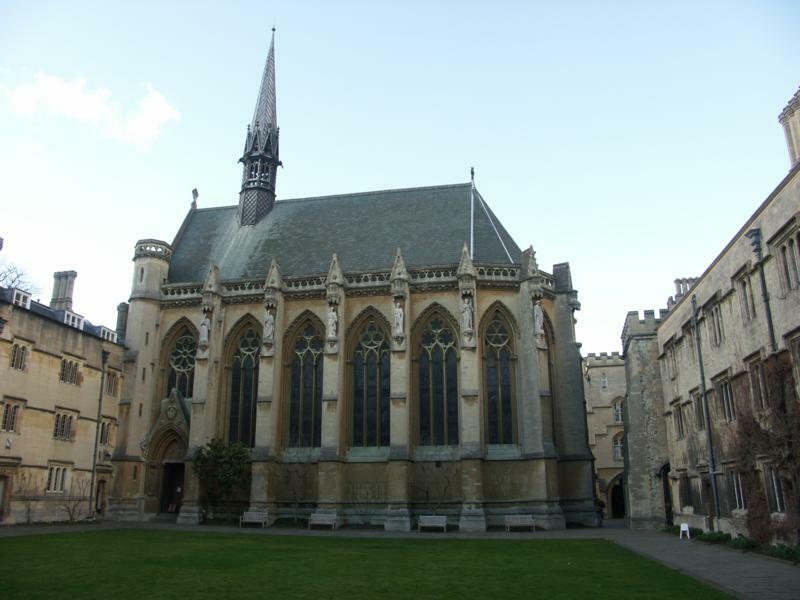 The chapel is not that large; a typical Oxford college chapel, if there is such a thing. The second choir was in the ante-chapel, and stood in two rows so that we all had a view of the conductor from behind. Of course, he had to remember not to keep his arms in from of his body! What a beautiful setting for making music! OK, try this Dropbox folder for quite a lot of music. Almost all is from two recordings, one in 1991, another in 1996. I'm in the '91 recording, rehearsed for the '96, but we recorded on the date of my 25th wedding anniversary; it was not a good day to record and come home to a party. Of the others: Peace, Peace is us in concert. Others are by others, though I've done some of them. I will download and listen to some of this when I'm at my mum's (I'm currently "packing") but I wanted to say that Paul's chapel looks fancier than mine but about the same size, maybe a bit smaller - certainly we have more altar space. When we record we have to take ALL the soft furnishings out - all the cushions, carpets and altar cloths. Quite an epic undertaking. I should mention that we do sing in different places; more often in Exeter College than any other at present; but, for instance, the American Christmas concert that I linked was in the chapel of St Peter's College, which is like a parish church, with nave, chancel, aisles and all, and we've done several concerts in my time in the University Church. Still to come, a solo and a choral movement to finish the Bush, Britten's Corpus Christi Carol, and the VW Fantasia. These have been left till last as they will be the hardest get usable - but I'm getting slicker at it all the time. Unfortunately the first track is almost inaudible at the start on my computer - hopefully it'll get louder. Edit: it did get louder! I like the first track. The Finzi I hadn't heard before, and it surprised me by not being a lot like the Finzi I've heard before. Lo, The Full Final Sacrifice is one of my favourite choral works ever (it was sung, by coincidence, at my baptism service). I will update you on the rest of the tracks another time, it's bed time now. OK I didn't go to bed yet. I love your version of The Seven Joys of Mary - especially the dissonant piano at the sixth joy. I heard that sung for the first time last week by Kate Rusby and thought that her jaunty cheerful quick speed didn't really suit the sixth verse in particular! The concert is now complete, and I've brought the levels up. I may do a bit more work on the files, but nothing substantial now. I've downloaded both American and English concerts into iTunes, and I'm adding the recording sessions you introduced us to earlier. They're a joy to listen to! When I have a little more time I'll see if I can play VoiCE in surround. Well, we've finished recording our latest CD (another single-composer disc, this one of music by Philip Cooke, who dedicated a piece to our conductor. The words and the music of the song are so sexual that we're fairly certain people are going to think they've had an affair...). We've also got our music list through for the term. My birthday falls on the Sunday of Candlemas, so we're singing some really lovely things that day, obviously because of Candlemas not my birthday, but it's nice. I've been assigned two solos in the term and one of them very interestingly is a soprano solo. I'm considering auditioning for the second soprano solo in the Allegri Miserere, which is comfortably within my range but unfortunately I'd be up against all the choir's actual sopranos, so I might not have a hope. You do realise, I hope, that the much-loved "traditional" version of the Allegri Miserere with that famous high phrase is a stylistically impossible fabrication by a late 19th century editor who completely misunderstood a comment made by Mendelssohn? I did not realise this. Tell me more! The Miserere sung in the Vatican was composed several times by different composers, following the same framework, so that the pieces are very similar. The best known version are those of Allegri and Bai, and a combination of these two was also sung; Mendelssohn said he couldn't even hear the difference! This was partly because the famous "secret" was not the pieces themselves, but the very elaborate ornamentation (called the abbellimenti) which was applied in the same way regardless of which version of the piece was being sung! A fairly detailed account which includes details of how the modern corrupt version got created is here. A very detailed account based on a late but genuine manuscript is here. Interesting! I was thinking a couple of days ago how Allegri couldn't have been the only person to set those words to music, just as Beethoven couldn't be the only person to have written a solemn mass. It's funny how certain works become synonymous with their names or settings, despite being one of many. The Missa Solemnis concert went well last night - although I felt awful for the poor alto soloist. She'd been struggling with counting for her entries in the rehearsal, as a couple of times she had to come in immediately after a tempo change and Roger Norrington has a tendency to stop conducting, or be very unhelpful (he told us straight out that he wouldn't be giving us our entries). He wasn't even using a score, and although he clearly knew the work by heart, it meant he didn't always know exactly who was coming in next. She got flustered in the performance and was quite badly out of time in the final section. It will only have been noticed by anyone who knows the work well, or those of us following a score... but that was several hundred people. Poor girl, she wasn't very old. Admittedly she's a professional and ought to be able to count, but I did feel bad for her. Paul, I told you I've been wanting to hear your surround sound recordings in surround sound. Here in Tucson, I've been working toward it. I don't like to put much money into a condo I occupy two months out of the year, but a friend here gave me a JVC digital media system with 5.1 speakers and digital audio inputs. After way too much time connecting TV, Apple TV controller and DVD player, I just got the women's trio coming out of at least 4 speakers using VLC app, but I don't have enough speaker wire to place the rear speakers properly yet. Still working on it.